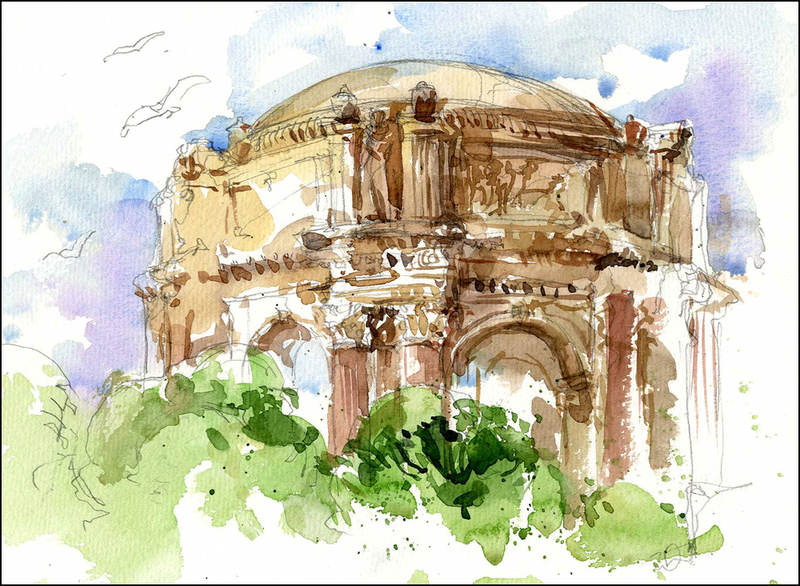 This Saturday was World Wide Sketchcrawl at the Palace of Fine Arts. I have mixed feelings about this monument to industry. It has a kind of artificial atmosphere – like walking through a huge (beautiful) stage set. Though you have to be impressed with the sheer chutzpa of its’ life cycle. Originally built for the 1915 Panama-Pacific Expo, it was part of a 600 acre artificial city that dominated the Marina district for one year. Architect Bernard Maybeck planned from the beginning that the structure would be allowed to fall into disrepair – he felt that every great city needed picturesque ruins. I doubt California will be making that kind of symbolic gesture with public monies any time soon. Subsequent generations have had to raise funds to restore Maybeck’s folly – preserving its idyllic ruined state. It’s main social function today seems be as a backdrop for wedding photos in the day time. and glow-in-the dark hula hooping videos at night. On related note, I highly recommend Erik Larson’s book “The Devil in the White City“. It’s an engaging history interweaving the break-neck public works project that was the 1893 Chicago World’s Fair, against the parallel true-life story of serial killer H.H.Holmes, one of America’s earliest recorded mass murderers. The book isn’t about about San Francisco’s Palace – but story of the rise and fall of the White City must have been similar in scope. These are just beautiful! I have spent many happy hours there when our sons were wee lads. I also sketched it last visit but dome was in scaffolding. Can I ask what type of paper you have used?Not that changing paper will help me paint any better! 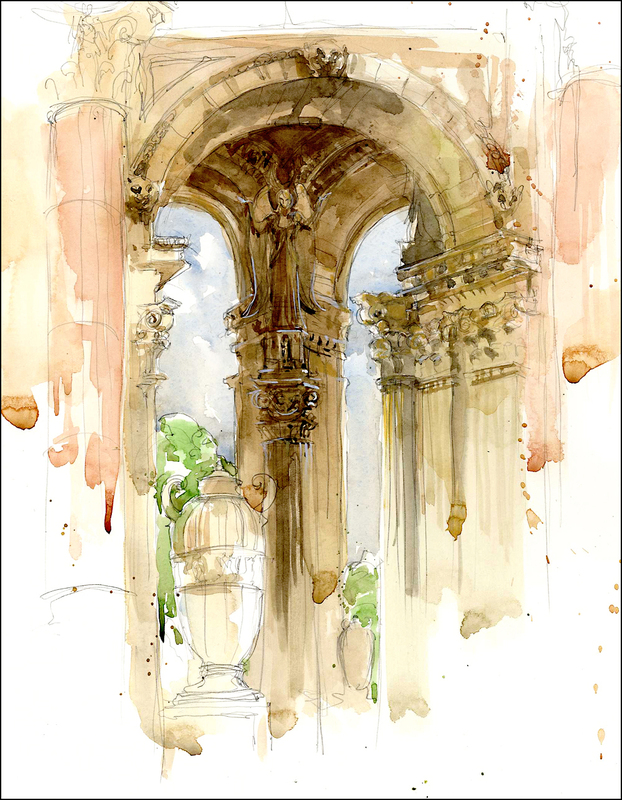 I may try the Arches rough as I usually use the reg.cold press.Your work is inspirational! These latest are very Sargentesque. MAN!!!!! when are you going to do an art book of this stuff!!!! So great!!! gosh! your stuff is incredible! These truly are inspirational and one would not get tired of looking at these. I am in SF for a few days of glorious weather.Off to Monterey for few days with hubbie and back end of the week. Any chance the ‘group’ is sketching next weekend–Aug.15-16? 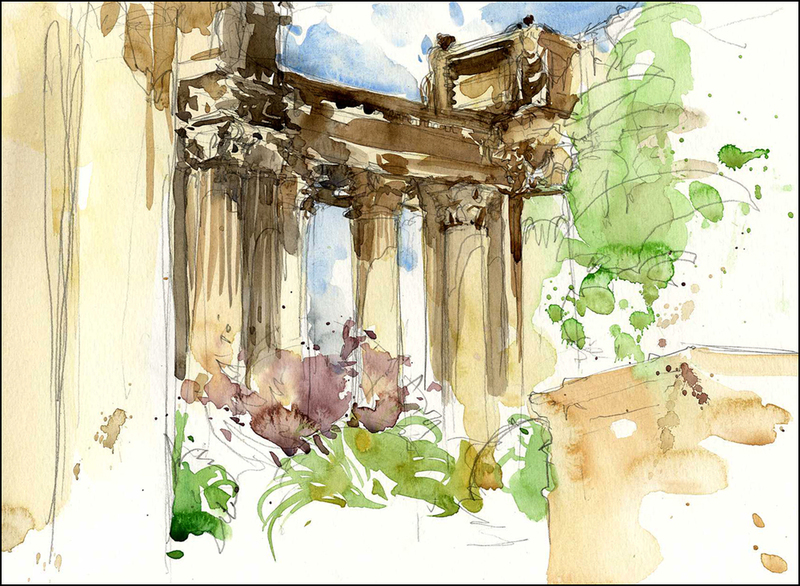 Yesterday I painted Palace of Fine Arts and had a wonderful day talking to lots of tourists from all over the world.Fun! Now this is excellent work. Congratulations! You have inspired me to practice, practice practice. First, thanks for doing a blog. I love watercolors and I’m trying to do them and get better at them. Your work is what I aspire to become. Second, these are so very lovely. The Palace of Fine Arts is one of my favorite buildings, maybe just because of it’s over-the-top-ness. I must rise to its defense. It is very much of it’s time and place, and it’s architect, Maybeck, is one of my professional inspirations (see his church in Berkekey, among other works.) Again, thanks for the lovely work.